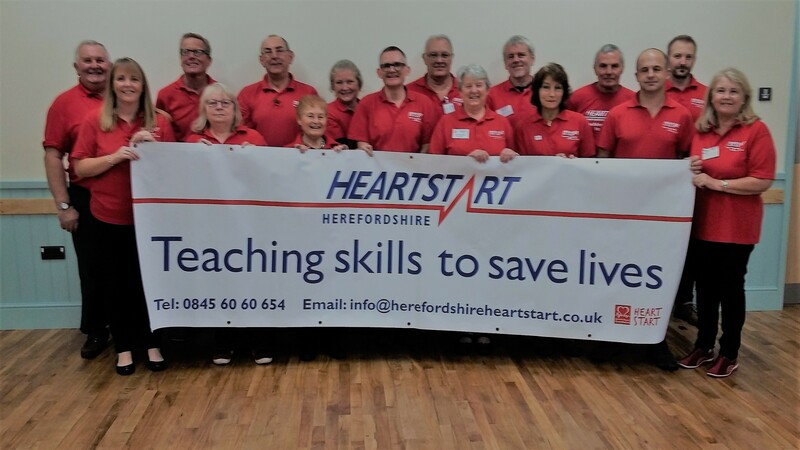 Volunteers from Herefordshire Heartstart recently updated their training at an event for those involved in the delivery of courses. This event was organised by the new coordinator to bring together volunteers old and new as well as an opportunity to meet the trustees and training supervisor for the charity. Since the charity started in 1996 Herefordshire Heartstart has trained over 23,000 people in Herefordshire with 900 people trained this year. Heartstart courses train members of the public in emergency life support skills. These skills are essential living in the rural communities of Herefordshire. Many villages have invested in the purchase of a defibrillator which is an essential piece of life saving equipment. Heartstart courses deliver the skills necessary to know what to do while the defibrillator is being collected and the emergency services are on route. Heartstart courses are free and all our trained instructors are volunteers. Herefordshire Heartstart relies on donations from the public to keep this essential service running within Herefordshire. The next public course is booked to run in Leominster on Tuesday 30th January 2018. Further information can be found on our website or social media pages. Booking is essential for this course. Contact info@herefordshireheartstart.co.uk for more information.